Keep your decks, outdoor dining areas, or pool-side patios shaded with this California Umbrella LUXY 118 OLEFIN Allure 11' round pulley lift umbrella with 1 1/2" stainless steel pole. Luxurious and captivating, the Allure series offers umbrellas that are both appealing and sturdy. This umbrella features a sleek, 1 1/2" thick stainless steel pole with matching stainless steel hardware for a robust foundation. Its 1/2" thick, high-density fiberglass ribs bend with the wind without snapping or breaking, yet provide excellent support for the canopy. In addition, the double wind vent allows for sufficient air flow to ensure stability and prevent the umbrella from moving with strong wind gusts. 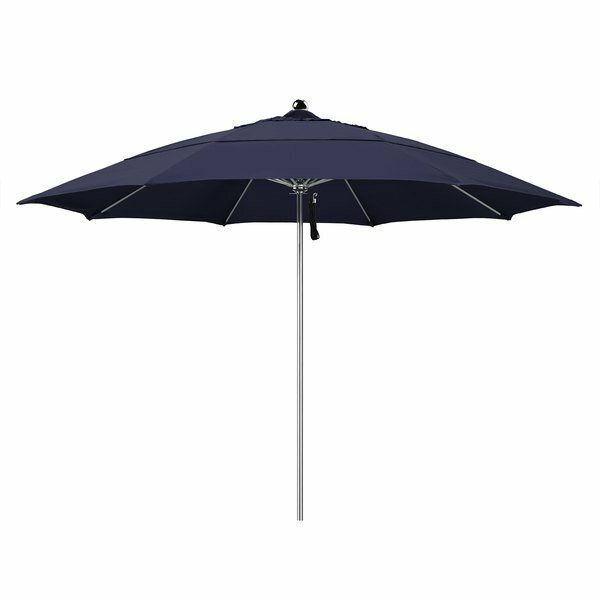 This umbrella's 11' size has sufficient area coverage, providing multiple guests with relief from the sun's rays. Its pulley lift also allows staff members to easily open or close the umbrella as needed. The pulley's simple, braided rope bears the weight of the canopy while opening and closing to eliminate force and fatigue, while the convenient pin stop in the center mast keeps the canopy in place while open. Height (to bottom of ribs): 78 3/4"